Preheat oven to 400 degrees. In a large roasting pan, combine tomatoes, peppers, and 3 tablespoons of the olive oil, tossing to coat. Arrange the vegetables in a single layer and roast at 400 degrees for 35-40 minutes, until the tomatoes are soft and wrinkled and the skins of the peppers begin to blister and turn slightly black. Remove the peppers from the roasting pan and transfer them to a zip-top bag or a bowl covered with plastic wrap; allow the peppers to steam for at least 10 additional minutes to help loosen their skins. While the vegetables are roasting, heat the remaining 3 tablespoons of olive oil in a large saucepan or Dutch oven over medium heat. Add the onion and garlic and saute for 7-10 minutes, or until very soft and translucent. Add the paprika, salt, and almonds, and cook, stirring, for 3-5 minutes, until very fragrant. Pour in the chicken stock and water. Bring to a boil, then reduce to a simmer. 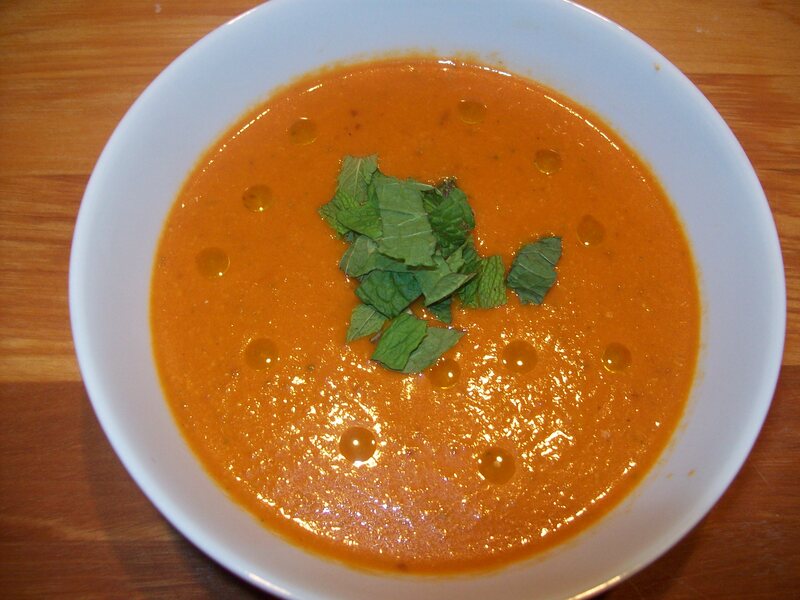 Put the roasted tomatoes, along with any juices collected in the roasting pan, into the broth. Simmer for 5-10 minutes, stirring occasionally. While the soup is simmering, remove the peppers from the bag and peel the skins off. Discard the skins. Add the peppers and mint to the soup. Remove from the heat and stir in the sherry vinegar. With an immersion blender, or working in batches in a traditional blender or food processor, puree the soup until it’s smooth. Taste and adjust seasonings. Serve garnished with additional mint and drizzled with extra-virgin olive oil.